Carbon-capture technology has been deployed for the first time as part of a waste incinerator in Norway’s capital Oslo. The experiment at the Klemetsrud incinerator will remove climate-warming carbon dioxide from fumes created by burning industrial and household waste. If successful, the technology could represent a significant contribution to reducing greenhouse gas emissions if deployed on a larger scale. “I hope Oslo can show other cities that it’s possible,” said the Mayor of Oslo, Marianne Borgen, at an opening ceremony. So far, carbon capture and storage technology has been experimented with in some fossil-fuel-fired power plants, but development has been hindered by high cost. The Klemetsrud waste-to-energy incinerator, which generates heat to warm buildings in the city, produces 300,000 tonnes of carbon dioxide a year – about 0.6 per cent of Norway’s man-made emissions. The experimental carbon capture and storage removal system consists of five containers with a series of pipes and filters through which the exhaust gas is fed. It captures carbon dioxide at a rate of about 2,000 tonnes a year. The experiment will run until the end of April. If the results are positive, a full-scale system could be built by 2020. Operators of the system say the carbon dioxide captured could be shipped to the North Sea and used for enhanced oil and gas recovery. “We see potential in this market across the world,” said Valborg Lundegaard, head of Aker Solutions’ engineering business, which runs the test. The operators have admitted that at the current price of carbon credits, the technology is nowhere near cost-effective. However, they claim that as the incinerator burns largely organic waste from food and wood, it actually removes CO2 from the natural cycle and not only that industrially produced. Development of new technologies capable of offsetting the devastating effects of rising temperatures globally was also in the heart of the UN climate talks in Paris in December. Earlier this week, climate scientists confirmed that 2015 was by far the warmest year on record – another extremely hot year in a string that started at the beginning of the 21st century. There is no doubt, the scientists said, that the situation is getting worse and is caused by man-made greenhouse gas emissions. Despite its potential, carbon capture and storage is still on the fringe. A 2015 report by the Australia-based Global Carbon Capture and Storage Institute said there are just 15 big CCS projects in operation worldwide, including a coal-fired power plant run by Canada’s Saskatchewan Power. Violence has broken out between the police and thousands of villagers in Guangdong protesting over the building of a trash incinerator. Villagers in Yangchun, Guangdong have been protesting since October 3, blocking the highway leading to the incinerator. Many demonstrators have been arrested. 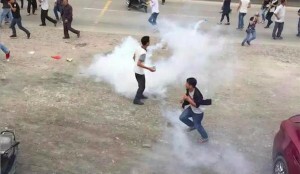 Clashes intensified this week when villagers knocked over a police vehicle and set it on fire,Apple Daily reported. The Conch Cement Company had concealed the fact that it was building and testing an incinerator facility in its factory area. The gases and contaminants generated, such as dioxin, would affect the residents who lived nearby, according to US-backed Radio Free Asia. “How will we survive breathing in noxious smoke?” an Internet firm employee told Reuters earlier this month. The building of the incinerator was seen as a sign of corruption and collusion between government officials and businesses as it was reportedly pushed through without having undergone an environmental impact assessment. The public had not been informed of the project beforehand and it was also not subjected to government supervision, Stand News reported. Videos and pictures on social media showed thousands of protesters gathered at the door of the company’s factory, holding red flags and bats. The police were reported to have used tear gas and arrested many of the protesters. Vehicles had been burnt, and many police officers and protesters were injured in the clashes. Protests over environmental issues are common in China, especially in Guangdong.CNA News reported that a similar incident had happened this year when thousands protested over the building of an incinerator in Wuchuan, Zhanjiang in Guangdong. The decision to build an incinerator in Hong Kong has presented a challenge to the government. It has had to put a lot of effort into trying to persuade citizens, especially nearby residents, that they will not be adversely affected by it. There is no doubt that over the last decade the government has tried hard to solve Hong Kong’s waste problem. When a waste reduction strategy is decided on, it is important to look at the short-term and long-term consequences of any policies. With an incinerator the chief concerns are environmental, such as air pollution and concentrated chemical waste byproducts. There are worries not just about people’s health, but the possibly devastating effect on biodiversity. However, incineration is better than building more landfills, which are not sustainable. The government has found itself in a Catch-22 situation when it comes to the incinerator. It is always difficult to strike the right balance. What is important is that all Hongkongers should cooperate with the government to try and reduce the volumes of waste generated. We have to think about our children, so we cannot be indifferent. Why are we still addicted to burning waste? MEPs are calling on the European commission to ban the incineration of recyclable and biodegradable waste by 2020 as part of the latest plan for the EU circular economy package. But as landfill is phased out across Europe, incineration is increasingly being turned to as a way to deal with municipal solid waste (MSW), while also producing energy and heat. There is a certain circular logic in powering and heating homes with the rubbish they generate, but it comes at a price. For every ton of waste incinerated, about 20% ends up as hazardous ash containing heavy metals and toxic substances that must be dealt with. “Waste-to-energy is a diversion of materials that come from petroleum sources. Some of the plastics might have a high calorific value, but they’re not renewable,” says Joss Blériot, executive lead, communications and policy at the Ellen MacArthur Foundation. He stresses that waste should be designed out as much as possible. Designing out waste involves finding alternatives to composite packaging and materials such as crisp packets that consist of atomic layers of metal which cannot be separated and recycled. But even materials that are recyclable, like plastic bottles, steel and paper, can lose 75% of value after first use. Eventually, this leads to a stream destined for incineration. There are, however, a growing number of ways to treat MSW incinerator ash to minimise waste. Eleanor Banwell, a biochemist and 2015 Schmidt-MacArthur circular economy fellow, believes incineration could play a part in the circular economy by collecting resources that would otherwise not be recovered. Her Royal College of Art design graduate project, MetaBlaze, considers how the value locked in ash could be exploited, assuming we can chemically process it. Rotterdam-based company, Inashco, uses a patented technology developed by the Technical University of Delft to recover and upgrade non-ferrous metals from municipal waste-to-energy ash for sale to global metal markets. Founded in 2008, Inashco is owned by the Fondel Group, a metals mining, production and supply company. Inashco is helping recover part of the aluminium, copper, silver and other metals worth €45m (£32m) lost annually during incineration in the Netherlands. Incinerator ash can also be used to create new products, for example, producing aluminium castings for the automotive industry, secondary aggregates in road construction, cementor glass, or as synthetic zeolites for use in catalysts. Treated in this way, however, the resources within MSW ash are locked into our urban infrastructure. A truly circular economy would see the MSW incinerator ash broken down into constituent parts that could be fully recycled and used again and again in manufacturing. This is no small technical challenge, nor would it be without polluting by-products. The composition of incineration ash contains an array of dioxins, chlorides, heavy metals and other hazardous substances and to cycle these completely would require intensive chemical processing at each stage. “Essentially, incineration output is very messy. It’s far better to extract resources at the front end,” says Warwickshire county councillor and incineration campaigner Keith Kondakor, whose work is currently based around waste prevention strategies. While mining incineration ash would still be better than conventional mining, which often entails land conflict and the destruction of habitats, incineration doesn’t do much to shift mindsets away from the industrial revolution’s dirty legacy. One fundamental issue preventing a shift in waste management mindset is overcapacity and stranded investments in incineration. A recent study by the Wuppertal Institute suggests that in six of the 32 European countries analysed, incineration capacities exceed more than 50% of the annual waste generation. “As soon as you have built [an incineration] plant, the sunk costs involved cause dynamics that clearly undermine waste prevention and sorting as prerequisite for high quality recycling,” says Wuppertal Institute researcher Henning Wilts. Howard Winn has been spot on with two pieces in Lai See (“Does the government need to rethink its incinerator project? “, July 3, and “Buried treasure a waste when we can sell it to the Europeans “, July 11) calling attention to modern ways to handle municipal solid waste. These include plasma gasification, waste-to-energy plants and the possibility of selling some of this waste to countries with excess capacity in waste to energy. Given our government’s penchant for sticking to outdated and costly technologies, can we possibly believe that its current plans to erect costly and outdated giant incinerators – generating no energy – are the best way to go? I think not. This municipal solid waste conundrum mirrors the government’s determination to build a monorail by the new Kai Tak cruise terminal. Again, compared with modern light rail, this will cost a lot more to erect and run. The government should look at Sydney, where they are tearing down their own unsuccessful monorail, which has been a blight on the city centre. Why can’t our government learn something from other parts of the world and give us modern, efficient, cost-effective infrastructure projects, instead of sticking to expensive and outdated technologies? In 1980 DOE projected that by 1987 there would be 160,000 tons-per-day of incineration capacity in the U.S. and double this by 1992. But in reality in 1988 incineration capacity was only 50,000 tons per day, and it was expanding at a snail’s pace. In 1985 there were 42 new incinerators ordered, but by 1987 it was down to 25 and by 1989 new orders has dropped to 10. In 1987, for the first time in recent memory, more capacity was canceled (35,656 tons per day) than was ordered (20,585 tons per day). The incineration industry had hit a wall. That wall was made up of local grass-roots citizens concerned about many aspects of solid waste incineration: dollar cost, hazardous air pollution, toxic ash, destruction of material resources, waste of energy, the political corruption that accompanies multi-billion-dollar public works projects, and the gobbling up of small, local waste haulers by the incineration giants. Gasification is NOT incineration as the side-by-side comparison of plasma gasification and incineration below demonstrates (as published on the website of the Plasco Energy Group). While this company is focused on the production of syngas, other companies (BRI Energy, Fuel Frontiers, and others) are focused on the fermentation of cooled syngas into biofuels (like ethanol). In plasma gasification the waste input is pyrolysed by the high temperature into its constituent elements: H2, O2, C, N2 etc. The converter conditions are controlled so that prior to exit, the elements reform into the desired syngas that is rich in CO and H2. The materials that cannot be converted into syngas, such as metal, glass, rock and concrete are vitrified to produce an inert slag. The slag is 1/250th of the volume of the processed solid waste.